A long, dark driveway towards an old farmhouse. A new stepsister with a nasty streak. A little sister who runs off. Something sinister lurking in the woods. Cassie Quinn’s new home comes with . . . complications. Cassie never believed in ghosts before. But now she is receiving strange messages, telling her to stay out of the woods. Are the messages just a ploy by her stepsister? Or are they warning her of an evil that stalks the shadows of the woods beyond her home? Cassie and her new family are moving out to the middle of nowhere. She is not thrilled about moving and having to deal with her new stepsister Ashleigh. Changes can be good, but not so much in this case. On the very first day at the new house, Cassie sees someone standing in the third floor window. She thought it was Ashleigh, but then Ashleigh runs out the front door. No way could Ashleigh make it downstairs that fast. Cassie plays it off like it was nothing, until other sightings happen and other strange experiences happen. Cassie has never believed in ghosts, however, the unexplained disturbances are starting to bring Cassie and Ashleigh together. Cassie and Ashleigh meet a group of kids at school, and quickly become friends. However, Cassie knows they are hiding some secrets when they find out they are living in the Donner house. Cassie becomes determined to find out what is going on and starts to investigate herself. Cassie finally retrieves some answers from Ben and then eventually comes clean to her friends about her and Ashleigh’s strange happenings. Wow, do not want to give out spoilers to a ghost story! That would totally ruin the anticipation of this story!! 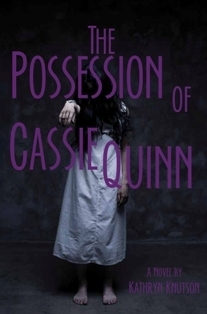 The Possession of Cassie Quinn is fast paced and down right creepy at times. All good elements in an exciting ghost story. Cassie’s determination and fearlessness totally makes me glad that this is happening to her and not me! This story totally spooked me! This story holds an awesome cliff hanger, just keeping you in suspense until the story can continue. Sounds like a great read! I've been searching for a book to creep me out, maybe this one is it! Great blog, been trying to subscribe via email, but for some reason it won't work for me o.O I'm still adding your blog button to my blog page though! OMG the cover gave me goose bumps! Sounds like a book I need to read ASAP! Thanks for the great review and info on book. I liked this one, too! I'm definitely looking forward to the sequel.